From document management, to bulk fax delivery systems, VOCAL’s Fax Over IP Server Library is designed to allow Linux and Windows developers the ability to create fax endpoints supporting both t.38 and t.30. Interoperability with fax devices of all types – whether they are fax machines, servers, gateways or cloud-fax, is a must – and FXSRV delivers. The ability to build fax infrastructure that can handle all of the variations of fax equipment out there is built in to this library: from the legacy low speed machines that are still in use all over the world, to Internet fax endpoints that can be running high speed fax with all the latest features. V.34 fax data channel – full and half duplex modulation for data rates from 2400 bps to 33600 bps. 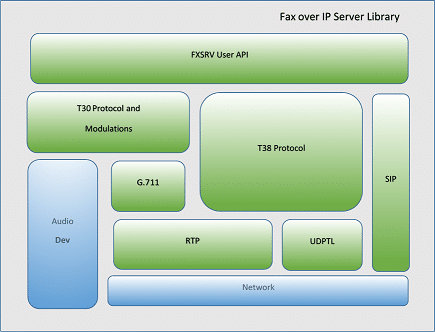 VOCAL has configurations supporting a broad range of fax needs. And because VOCAL has supplied the fax code for the fax gateways of the analog telephony world, you know that the modems are industrial grade. Vocal servers come in a variety of configurations which cover the full range of ITU T-series and V-series Fax protocols. The server has a simple yet full featured C-callable API. This allows it to easily fit into currently existing systems. Configuration and control are flexible, to meet the needs of already deployed infrastructure and applications. In addition, VOCAL can customize or build to suit, in order to meet very specific system requirements.